Somehow, among all of the other things I missed while frantically working several jobs to make up for lowering income and higher cost of living here in the magic land of endless Recession, was an NBC-TV sitcom called Community. It apparently had quite a cult following (reminiscent of another low-rated NBC property, Star Trek), and now there's filmmaker Neil Berkeley’s HARMONTOWN, something very near Community: The Motion Picture. But watching it again made me feel like I came late to a party to which I was never invited (a familiar feeling). 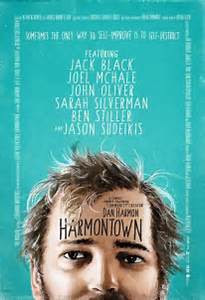 HARMONTOWN is a portrait of Dan Harmon, a TV comedy auteur, respected by his peers (here Ben Stiller, Sarah Silverman, Patton Oswalt, Jack Black) despite his oddball, domineering personality and possible alcoholism. Harmon created Community, which, during a low-rated run, amassed fans whose letter-writing campaigns strove to keep it on the air. At one point Harmon was fired from his own show after a public tiff with cast member Chevy Chase. Thus, the frustrated Harmon started podcasts and a live stage show, "Harmontown," that blended unrehearsed monologues, guests, and Dungeons & Dragons sessions. It rallied even more self-declared misfits to his side. Here Harmon, despite being on TV-script deadline pressure with a fresh project, takes girlfriend Erin, "Dungeonmaster" Spencer Crittenden and other hangers-on on a national "Harmontown" tour. Despite Berkeley's efforts to pull everything together, it's a marathon of quasi-stand-up schtick and road diary that has trouble translating the appeal of the whole thing for newbies. Harmon drinks to excess (at one point making the disastrous decision to down genuine Tennessee moonshine proffered by an audience member), stuns his admirers when he discloses details of his ugliest fights with Erin, and enjoys the support of simpatico nerds. He openly wonders why he’s doing all this, and claims he's just trying to make people happy. But, like so many of our comedy entertainers, Harmon acknowledges the paradox of being a chronically miserable individual (blamed to an abusive family background). Spencer Crittenden, he meanwhile observes, is like his holy fool or Christ figure in some kind of DIY psychodrama in which Dan Harmon is more of a string-pulling villain than anything else. In the meantime, we are told the obvious, that Harmon and the show Community have, by earning culthood, created their own community (though I suspect Chevy Chase, not interviewed, might have some words to say about that).